The study of orthopaedics and fractures is hugely important to every undergraduate medical student, and it is difficult finding the right textbook that will give them a sufficient level of knowledge and help them through their examinations. "Textbook of Orthopaedics" is just such a book, giving more than enough information, while at the same time focussing on the main goal - passing the orthopaedics exam. The book is divided into 8 sections, which deal with the obligatory, standard areas of study, such as general orthopaedics, regional injuries, and both traumatic and non-traumatic disorders. But there are also innovative sections which discuss amputations, prosthetics, sports medicine, arthroplasty and arthroscopy, and the final section of appendices gives information about orthopaedic implants and instrumentation in common use, as well as tips and hints for practical exam sessions. The book is very "student friendly" with numerous excellent pedagogical features - diagrams, end of chapter summaries, flow charts, mnemonics, differential shading of tables and columns, anecdotes, jokes, and historical references. X-rays are found at the end of each chapter and there is also a focus on back ache, a very common orthopaedic problem often neglected by other textbooks. 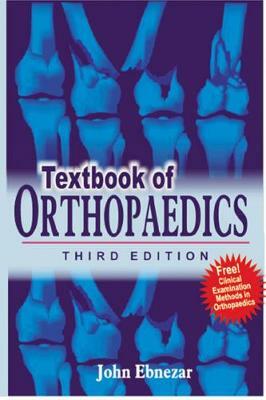 In short "Textbook of Orthopaedics" is an exam-oriented textbook designed and written specifically for medical undergraduates.